I have been developing loads for my 6.8mm SPC II with longer than mag-length COALs using not so common powders for the 6.8mm, I’ve begun to question how I recognize high pressure signs since there is no manufacturers’ load data to rely on. I typically get primer craters early with my 6.8mm AR compared to my bolt rifles and I think that is due to excessive tolerance (slop) around the AR’s firing pin hole plus. The 6.8 primers still haven’t been flattened that much when the craters show up. This is unlike my other rifles where the primers are flattened and, if a hint of a crater shows up, you are at the max. I have also been watching for swipes up until now but they have changed with the installation the adjustable gas block. With gas turned down, the swipes have been noticeably reduced. So I searched the forums and found some information regarding using case head expansion to determine over-pressure situations. They were saying that expansion of the case head more than 0.0005” to 0.0010” was an overpressure situation. I thought I would investigate. I've primarily been using Hornady brass with CCI 450 primers fired from an 6.8mm ARP barrel. I have 70 fired Hornady cases in the pipeline that are either resized and ready to reload or have been fired awaiting to be resized. I have not been keeping track of how many times the cases have been reload. A couple are once-fired while most have been fired multiple times, likely 10 or more. Below is a graph showing the 6.8mm Hornady case head dimensions. The fired cases are represented in red and resized in blue. The average for the fired Hornady cases was 0.4206", a typical increase of 0.004" expansion compared to new (average 0.4166). The brass that had been already resized averaged 0.4201”. Even though the resized cases are running an average of 0.0035” larger than new brass, I have had no issues with feeding. Note the measurements in the graph are to ten one-thousandths of an inch. I found no direct correlation between case head expansion and loose primer pockets, e.g., the largest case 0.4216" still had a tight primer pocket while one that was 0.4203 was discarded for a loose primer pocket. Resizing in a Redding die reduce the case head diameter and average of 0.0004" (4 ten-thousandths) for the cases with the least expansion and as much as 0.0011” for the cases with the larger diameters. I have recently fired some 110 TSX from new SSA brass with various quantities of AA2200 and CFE223 powder with a 2.380" COAL (the 6.8mm magazine length is 2.260” to 2.295”). The measured expansion from new to once-fired is shown in the picture below. The cases expanded various amounts. Some of these were on the hot side but, after the fact, I have no way of determining which case went with which powder load. I will rectify that as I learn more about possibly using case-head dimension as a technique to determine over-pressure situations. Below the pictures is a graph showing the case head dimensions after running the brass through the resizing die. I made it to the range yesterday with a mix of Federal, Hornady, and SSA cases, new and resized and took some before and after measurements. The Federal was factory 90gr Gold Dots. 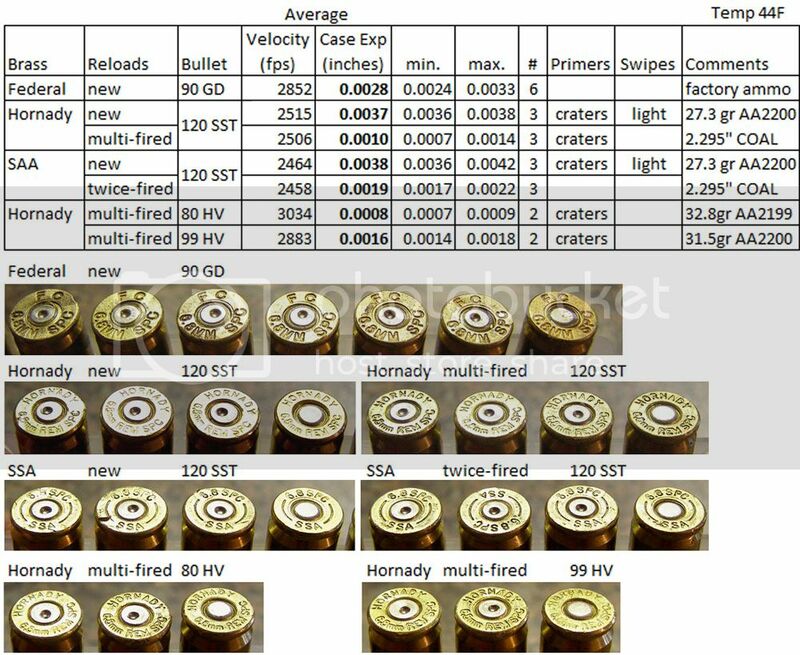 The Hornady and SAA were reloads with 27.3gr of AA2200 under 120gr SSTs, 2.295" COAL (27.2gr with a 2.260" COAL is the manufacturers published max load). I also had a couple GS Custom bullets in Hornady cases. I fired them and measure case head expansion to learn some more. The results are listed below. Well the 0.0005” theory didn’t pass muster as the new cases expanded 0.0024” to 0.0042”. Resized cases expanded much less but still greater than the 0.0005” assumption. I even checked one of my .270 Win cases that had been reloaded multiple times – it expanded 0.0014” (Rem brass, 129gr LR, and CCI 200 prime over 56.0gr of IMR 4350). I’ve picked out a dozen cases that I can follow through their reloading life to see how the case head dimensions change. I’m still pondering the results. Please feel free to share your experience or opinions. Ive had a single .270 case separate at the web area and one other crack. both were on thier first reload and I didnt load them a sports shop did. last time Ive done that I got my own gear and havent had issues since. Ive had primers flatter than a pancake but never a smoked one. havent seen the so called extractor marks. I dont sort brass as Im too lazy but run the paper clip feeler guage test on cases. never had a primer pop out on me so I guess the pockets havent been stretched too much. I believe its far better to have a good average load than a hotter than hot one...easier on all components not least my shoulder. I believe its far better to have a good average load than a hotter than hot one...easier on all components not least my shoulder. Elvis, I agree. In a way, I'm turning the 6.8mm into a wildcat cartridge by loading bullets longer than magazine length COALs. This is allowing me to get better accuracy by seating bullets closer to the lands. It also gives more space for powder and using heavy heavier bullets with slower powders for which there is no published load data for either. I've quickly seen significant accuracy improvements (some loads are 1/4 MOA). I'm just trying to be diligent and make sure I don't get the pressures too high. Plus I like to tinker with the details. The method of measuring case head expansion as I understand it involves setting up a control to work against !!! 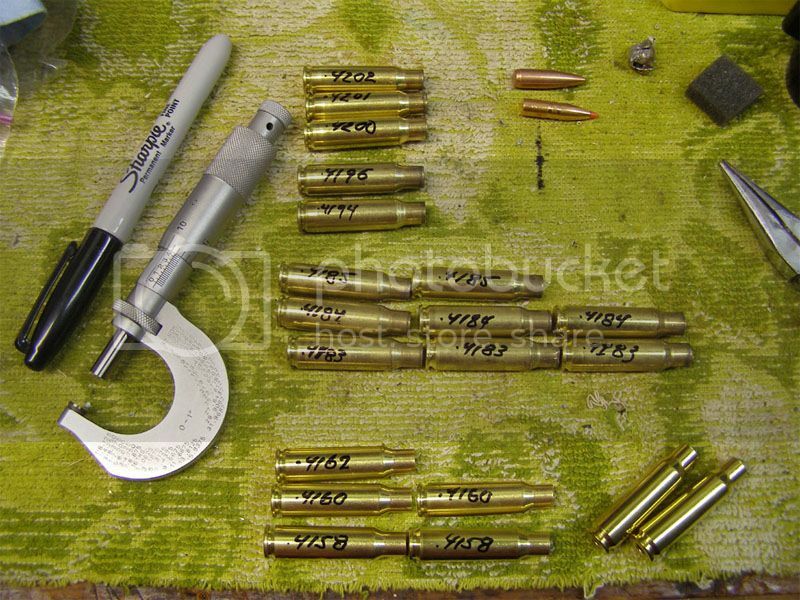 The use of factory ammo and it's brass makes this process simpler. Keep in mind that you do not know the actual working pressure of the factory round. It's possible that the factory ammo chosen could have a lower operating pressure than that set as a max for that cartridge. First take 5 cartridges, find a mark on the head for a starting point and take measurements from 3 equally spaced positions and average them together. Take those 5 averages and average them. It's important to do this because brass does not expand evenly. Next fire the ammo and remeasure the same way. Take your unfired average and subtract it from you fired average. This becomes your average expansion/control. Now it's just a matter of reloading that brass and not exceeding your control. Using other brass complicates things because now your dealing with brass that will more than likely have a different composition. One method for dealing with this is to carefully pull the bullets,primers and powder from factory ammo and insert them into your preferred brass to obtain your control. chambered, thanks for sharing the details on measurements. I had noticed that the cases werent perfectly round so I was marking the case and measuring in the same point. I try your suggestion next. I have had the experience of pulling a bullet from Federal factory ammo and putting the powder and bullet in one of my Hornady resized cases (but with my primer). I have seen as much a 40 or 50 fps difference between different 6.8 brass. However, going from new Federal brass to used/fired Hornady brass resulted in a velocity increase of 230 fps (2915 vs 3145 fps mv)! Inspection of the Hornady case post-firing indicated I was as close to blowing out the primers as I’ve ever come – carbon residue escaped around the primer pocket. I probably should have put a disclaimer on that method !!! I'm not sure I'd implement this method but if I did I wouldn't substitute the primer. Primers can often have more influence on pressure than some seem to think. I believe that using the factory ammo and brass throughout you could obtain enough knowledge to comfortably switch at some point to different brass. Here is what I am thinking about doing next. I'm going to repeat the testing done with 120 SSTs loaded at 2.295" COAL and new/resized Hornady/SSA brass with the SSTs loaded to 2.345" COAL to see if there are signs of reduced pressure. 2.345 places the bullet 0.015" from the lands. Since there is significantly more case expansion with new factory brass (making it easier to measure), I'm also going to do some powder charge vs velocity ladders with new brass and keep track of how increasing the charge affects case expansion. This is close to what you suggested. I could buy another box of factory SSTs but they are loaded for the orginal 6.8 SPC chamber. My 6.8s are have the SPC II which is higher pressure, 55,000 psi verse 58,000 psi. I think many reloades are higher than that, me included. If your using a chronograph pay particular attention to velocity deviation..... this could give an indication of pressure spikes that will occur when excessive pressure starts to mount. Agreed! IMO, if your doing load development without a chronography, you don't know truth! as for longer than mag length...well its the first shot that counts. reading one of Greg Duleys articles last night (NZ Hunter mag) they developed loads like that too in one of thier 7mm wildcats if they used the long very accurate load they needed to remove bolt to extract unfired round!!!! dont know how well that will work in a semi!!! pete4d, I have tried different primers. I have CCI 400, CCI 450, and Rem BR. I've tried all three at various times. The CCI 450 gave me the most velocity and usually the best groups. Agreed that one primer can cause more pressure than another. I'm not trying to reduce my pressure but learn how to best read what I do have. I also have decided to use the CCI 450 (magnum) primers for my 6.8 loads because I'm using slower more dense powder and need cold weather reliable ignition. I also did some measuring of case expansion when I was having extraction issues in my Savage 99f in. 308 win. Using new Winchester brass from the same batch and keeping loads identical in every way I experienced up to. 001 varability in case head expansion measured at the edge of the extraction groove. Since there is always some margin of error in everything from the composition of thr brass, its elasticity and all the component measurements used in reloading I was not surprised. After I neck sized, reloaded and fired these cases a second time they either remained the same or at most expanded. 0005. I would put this down normal errors associated with measuring using non-labratory quality tools.. I went back and checked a dozen cases of new brass from the same batch and these also varied +/- .001. I have read that another point of measurement is the extraction groove. It is is one location that brass can flow once the space between the bolt face and case is taken up. Never tried it so I can't vouch for the method but it sounds plausible.